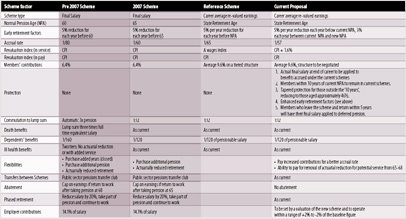 While some of the details are still being discussed, after much negotiation the main features of a revised Teachers’ Pension Scheme for 2015 have been published. David Binnie explains the changes and what they mean for members of the scheme. After many months of intense and sometimes fraught negotiation by the teacher unions and government, in March the latest, and what looks to be final, agreement on changes to the Teachers’ Pension Scheme was put on the table. This was the third version of a revised scheme put forward by the government and, while it is clear that this will not be as generous a scheme as the two existing ones, it is considerably better than the government’s ‘reference scheme’ which was its initial and preferred option. The actuary who works on behalf of the joint teachers’ side has confirmed that the whole range of ASCL members will be better off under the final scheme than the reference scheme. ASCL played a leading role in securing the improvements, in particular arguing for the improved accrual rate, the enhanced early retirement factors and other flexibilities. A significant achievement was keeping contribution structures and levels open for further negotiation. ASCL Council decided in March that the union should continue to negotiate around this model as it is the best deal that can be secured – recognising that the government threat to return to their reference scheme if progress is not made is a real one. The new scheme will take effect in 2015 and, whilst much of its design is self-explanatory, there are a number of aspects that warrant further clarification. The rise in contributions that came into play in April is not part of the new pension scheme. This rise, together with any to follow in 2013 and 2014, are part of the Treasury’s budget deficit reduction programme. It has, however, been agreed that the rises in the next two years will be subject to further negotiation in light of the impact of the first year’s rise. Contributions in the post-2015 scheme will have to average 9.6 per cent but the structure of tiers and the levels of contributions are yet to be negotiated. 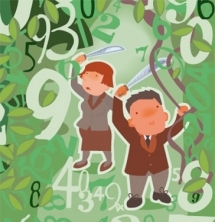 A career average scheme is not based on any form of arithmetic mean. The proposed scheme will give a pension that is the total of each year’s accrued pension increased by a revaluation factor (Consumer Price Index (CPI) plus 1.6 per cent). Each year, an individual’s actual salary for the year will be multiplied by the accrual rate (1/57) and this amount credited to his/her notional pension fund. In each successive year not only will that year’s accrual be added to the fund but all previous years’ accruals will be increased by the revaluation index. The final pension is the total of all the individual, inflated, years’ accruals. A range of protections have been put in place which benefit many ASCL members. All members with accrued pension in the current schemes will have this element of their pension calculated on their actual final salary rather than their 2015 salary, if the final salary is greater. Anyone in the pre-2007 scheme who was 50 on 1 April 2012 will not have to move to the new scheme, even if they work beyond 60. This also applies to those 55 and over in the post-2007 scheme (although with a pension age of 65). Tapered protection applies to those who are close to, but below, the 1 April age thresholds. For each month a person is below 50 (or 55 for the post-2007 scheme) on 1 April 2012 two months protection is lost. For example someone in the pre-2007 scheme who was 49 and 6 months on 1 April would have 12 months less protection. This means s/he is protected for 9 years instead of a full 10 years and would transfer to the new scheme at 58 and 6 months. Someone who was 46 and 8 months would have 80 months (or 6 years and 8 months) less protection; therefore s/he is protected for 3 years and 4 months and would join the new scheme at 50. The accrual rate is the proportion of salary that contributes to one’s pension. The proposed rate of 1/57 is more advantageous than the 1/65 offered in the reference scheme and the 1/60 offered in the November review. This benefits all scheme members. The revaluation index is the inflation index used to uplift each year’s accrued benefits. It has been reduced slightly in order to achieve the better accrual rate and in light of a more realistic forecast of future teacher pay rises. This combination of accrual rate and revaluation index gives a slightly greater value to those with salary increases later in career (applicable to many ASCL members). Currently there is an actuarial reduction of approximately 5 per cent per year for taking a pension before the normal pension age (NPA). This will continue to apply but, for those who have a pensionable age over 65 in the new scheme the reduction will be only 3% for a maximum of three years for the period between 65 and their NPA. This makes the possibility of retiring at 65 more viable. Currently one can purchase additional pension. In practice, this is largely unstructured with the decision to make a purchase often a response to circumstances rather than as part of a medium- or long-term financial plan. ASCL has argued for scheme members to be able to take greater control of their pension planning and to have a more clearly predictable mechanism for additional pension contributions. It will be possible to plan to increase one’s contributions for a period of time in order to have an improved accrual rate. This will be subject to a cap as are current additional pension arrangements. Additional voluntary contributions (AVCs) will continue to be an option. There is still a great deal of work to be done in terms of developing the detail of regulation and practice within the new framework and ASCL will continue to play a full part in this, to ensure that ASCL members get the best possible arrangement for their retirement. David Binnie is ASCL’s pensions specialist. As of going to print, negotiations on the Local Government Pension Scheme still have not resumed, although it was anticipated that all parties would come back to the table in March. ASCL understands that the union side is waiting for a response to a series of proposals they put forward earlier this year. We remain in close touch with the unions bargaining on behalf of scheme members and will put an update in the weekly email newsletter as soon as there is something to report.